The end of the first half of my wedding season came to an end with the most perfect North Carolina wedding, you guys. You all may remember Hope and Kirkland from their AMAZING winter engagement session in the Shenandoah Mountains, but if you don’t, you have to go check it out. (Seriously.) They have this crazy sweet love for each other, one that is full of a strong faith in God and appreciation for what they each bring to their relationship. 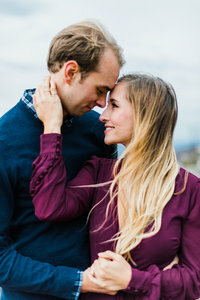 In case you aren’t familiar with Hope and Kirk, they met 8 years ago as freshmen at Averett University, and even though the two of them found themselves in other relationships over the years, Kirk always took the time to wish her a happy birthday. About two years ago, when they reconnected, everything fell into place for the two of them. During a coffee date when I first met Hope, she gushed over Kirk and his family, and I have to tell you – she was right! (But, I absolutely LOVED Hope’s parents as well, and you can certainly tell the two of them were brought up by amazing people!) I always thought it was simply beautiful to watch Hope light up when she saw Kirk, but on this day? It was indescribable. When I asked what she envisioned for their wedding day during that coffee date, she immediately responded that Kirk was what she’s looking forward to the most. I can tell you that on Saturday, he’s all she could think of. I heard his name spoken more times than you can imagine, and when she saw him under that magnolia tree waiting for her, it was electric. Southern Charm. That’s what Amanda Day Rose used to describe the theme for Hope and Kirk’s wedding, and it was the perfect way to put into words what their North Carolina wedding truly exuded. Southern Charm. Penn House is the perfect little Southern house, with perfectly decorated rooms, gorgeous natural light, and white-washed brick walls that made for perfect backdrops. The old trees and gardens provided the perfect amount of shade and burst of color, and but what set it all off were the large white umbrellas sprinkled throughout the ceremony seating that Hope and her momma made sure brought relief from the summer sun. During the ceremony, both Hope and Kirk wrote testimonials to the lives they’d lived so far and to their parents and families that built them up. They shared communion together beneath the magnolia, in front of vintage window frames that were hung from its branches. I can sincerely say that I was left in tears, touched by the stories they told, the faith they nourish together, and the gratitude they have for their families and friends. 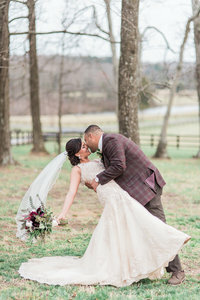 The reception details at their perfectly Southern North Carolina wedding were charming and vintage, creating an inviting atmosphere for their guests to celebrate such a timeless love. Vintage mirrors and dusty blue furniture, simple, beautiful greenery and lots of candles and lanterns, gold accents, and gorgeous florals. It was absolutely beautiful, and somehow, once the ceremony ended, what was supposed to be an unbearably hot day, ended up being the perfect summer night of celebrating under twinkling patio lights. It’s a day I won’t forget, for sure, and if their life together is wrapped in the warmth of that day, it’s going to be a good one for sure. Hope and Kirk, I’m not sure I can put into words just how grateful I am that our paths crossed last fall. It was an honor witnessing such a beautiful day and the start of your married adventure, and I can only pray that I get the chance to witness many of the blessings and milestones that life together still has in store for you. More importantly, though, I pray that God continues to bless you with the happiness and love I saw that day, because you both truly deserve it.